Unbelievable but true: my first granny crochet blanket is finished. I started this back in December (of 2012 that is) and thought it would never end. It started with some inspiration from this tonal squares pattern found on Ravelry. I wanted it be to be a showcase of my favourite shades of blue and their possible combinations. Some squares work better than others for sure. But all in all the result pleases me highly. 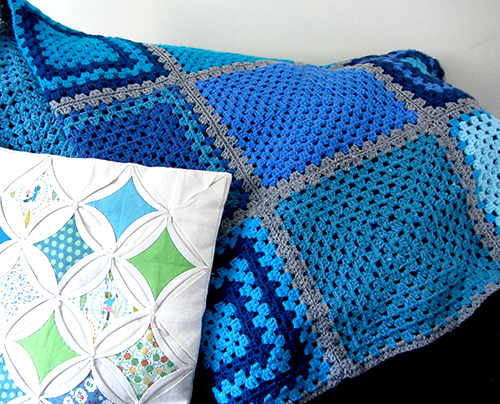 This is the beauty of these granny square blankets: they are great to use up left over yarn and they work even better if they don’t look perfect. This bit of shabbiness gives it a vintage and homy feeling. Anyway I find the sight of this blanket on my sofa very comforting. The good surprise is this new addition works very well with my first quilt and my cathedral window pillow. It feels really great to build tour own home decor! Next are more quilts and three pillows looking for their cover. We plan to get our fire place working sooner rather than later so I can foresee a very cosy winter.